The controversial plan to build three towers at 900 Albert St. — including one at 65 storeys, which would be the city's tallest — was approved by council in a vote of 16 to five. Council also approved the East Flats and library precinct developments. The controversial plan to build three towers at 900 Albert St. — including one at 65 storeys, which would be the city's tallest — was approved by city council Wednesday in a vote of 16 to five. Coun. Catherine McKenney, who represents the ward where Trinity Group's project is located, as well as councillors Mathieu Fleury, Tobi Nussbaum, Jeff Leiper and David Chernushenko, voted against the plan. Mayor Jim Watson supported the project, arguing the location near the Bayview LRT station — where the Confederation Line and Trillium Line intersect — is the perfect place for intensification. The proposed project is a mixed-use complex including 65-, 56- and 27-storey towers, all on three-storey podiums above six levels of underground parking. "Staff anticipate that this development will add 1.6 million transit trips per year," Watson said. He also reminded his colleagues "this was a contaminated site and it was never going to be developed without council support." Indeed, council approved about $8 million in waived future property taxes to the developer in the form of a brownfields grant. The city also reduced development charges because the developer had to move a tangle of city infrastructure for the project to go ahead. Local residents and McKenney, the ward's councillor, had a number of criticisms of the project across the street from Bayview Station, including that the proposed heights ignore a piece of the city's formal planning policy, called a secondary plan. That plan was developed through a time-consuming process between city staff, landowners and the community to come up with a blueprint for the Bayview area, and it called for maximum heights of 30 storeys. Indeed, public delegations at Tuesday's planning committee meeting on this file said they felt they had been "lied to" by the city. Watson and other staff members have argued council can disregard the Bayview secondary plan because the application meets criteria under a council change to its official plan, known as OPA150. However, it's unclear how OPA150 lets the city off the hook for respecting the Bayview plan, as it states: "High-Rise 30+ buildings will only be permitted where they are identified in a secondary plan." It's also important to note these higher towers don't increase density at the site, but simply re-arrange the same density into taller forms that the developer wanted. Asked about the apparent disregard for the secondary plan with regard to height, Watson said anyone can apply for exemptions to planning rules. The Bayview secondary plans also states that 25 per cent of future developments "shall" include affordable housing units. However, it turns out the city has no way to enforce that a developer include that much affordable housing in a project. That led McKenney to change a motion guaranteeing the affordable units to one that simply "encourages" them. Also included in the motion, at the suggestion of Egli, was the unusual language that the city could go back to the developer after it "has the legal ability to mandate a minimum number of affordable units … should such be legally possible." Removing all exterior parking from the south side of the development. Working with developer to help the south side better integrate with the community. Ensuring the number of bicycle parking spots is equal to or greater than motor vehicle parking spaces. Re-directing $450,000 the developer was going to put toward a future footbridge over the O-Train corridor to community gardens and parks. Ensuring intersections in the development area serve pedestrians and cyclists. ​The motions were carried by council. Council approved two other major development applications in the Albert Street area: the central library precinct and Claridge Homes' East Flats project. 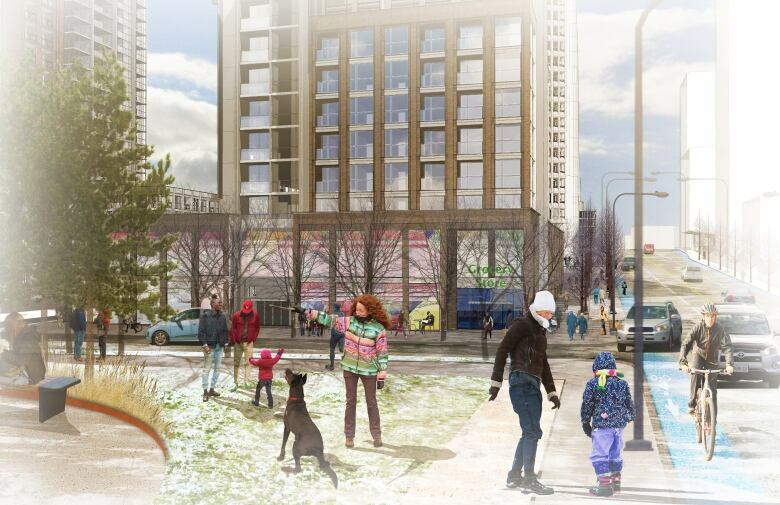 The site for the new central library, just east of LeBreton Flats, was zoned from 12 storeys. The library isn't expected to be built until 2024. The two parcels of land immediately to the west are owned by the National Capital Commission, and were rezoned as part of the same application for 25 storeys each. It's unclear what the NCC has planned for its two pieces of land, although it did request that the city rezone the land for an aquarium. East Flats is the name Claridge is giving its LeBreton Flats land development east of Booth Street, which it bought from the NCC years ago. The 1,600-unit plan calls for, among other things, five highrises — one soaring to 45 storeys — and opens out onto the Booth Street bridge. McKenney directed staff to "encourage" Claridge to have a public meeting after the detailed design of the first phase of the project is complete. She also called for the developer to include details on its promise for a grocery store, daycare and affordable housing in its application to the city, whenever that may occur.